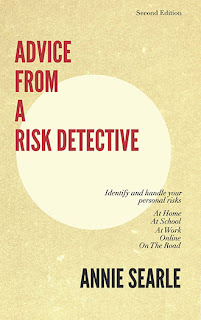 My book looks at the commonest risks in four areas of life -- home, work, online and on the road. I would have added a fourth area -- mental risk -- but decided instead to try to incorporate that risk inside the external four. There's so much noise in the world that it's sometimes difficult to hear oneself think. Yet thinking is at the heart of the premise of my book: Managing risk is possible only by thinking about understanding what constitutes a potential threat or behavior. If you're tired or burned out, then your mental risk is probably higher than at any other time. You need personal time and a good night's sleep. You don't need to be posting too much data on social media sites or in blog entries. You can erase the post later, but you can't erase the impression you leave for those who read it. Which puts us back to the slogan I posted last week: "Measure twice, cut once."